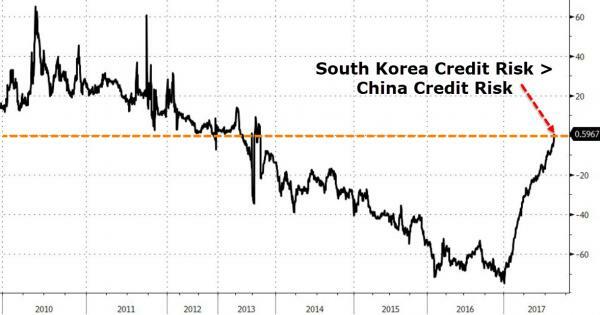 For the first time in four years, the credit market sees more risk of a South Korean sovereign default/devaluation than China. As a North Korea war potential approaches, with the regime said to have attack ready nuclear missiles, Daiwa analysts Kevin Lai and Olivia Xai note the awkward position the US military and diplomatic corps finds itself. “It seems the US has miscalculated the possibility and time needed for North Korea to make a program deliverable,” they wrote, and there is a sense the point of no return is passing. 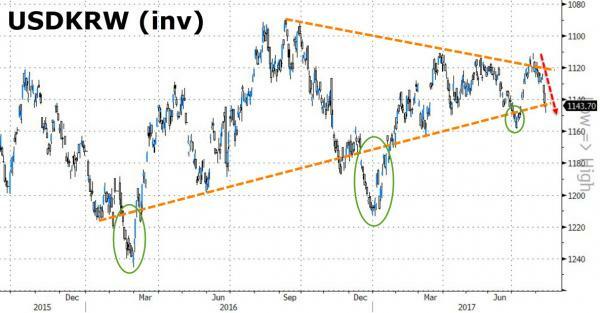 Escalating tensions over North Korea have also sent the dollar surging against the won to test a critical downtrend line resistance in a triangle formation. By making such a promise, Kim looks to have chosen a path of no return. If he delivers the plan, the US will almost certainly respond aggressively with a range of military options — and the situation will escalate to a major military conflict involving several more parties, including South Korea and Japan. There would be little room for either side to step back. If Kim doesn’t deliver, he risks creating a political crisis for himself and permanently weakening his regime. He is now in a position similar to the one Saddam Hussein was in before Desert Storm. His primary goal is regime survival. Giving up nuclear weapons would mean abandoning that goal; bending to US pressure would leave him politically vulnerable at home. 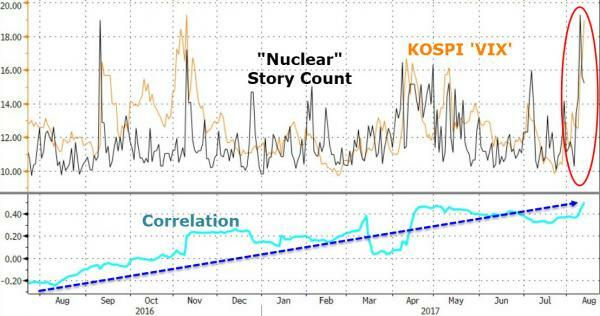 While a nuclear war appears a distinct possibility, stock markets are acting rather benign. They think too little geopolitical risk has been priced into the market.